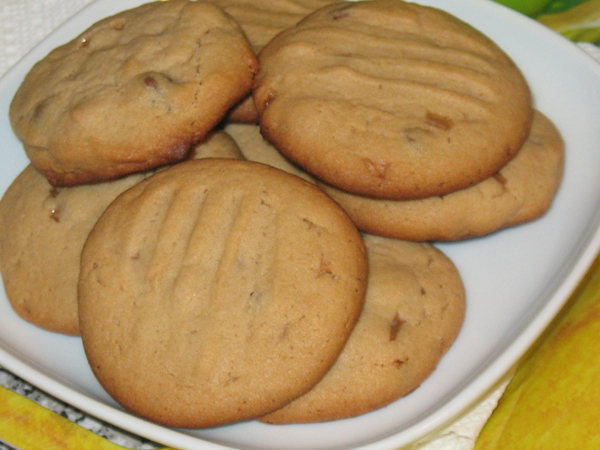 Recipe inspired by: Good Housekeeping Cookies! In medium bowl combine: flour, baking powder, baking soda, and salt. Set aside. In mixer cream together butter, white sugar, brown sugar, and peanut butter (use a greased cup for peanut butter). Beat until fluffy. Beat in eggs, vanilla, and corn syrup. On low speed, add the dry mixture by thirds, beat until just combined. Cover and chill dough for 30 min. When you take the dough out of the fridge, at that point turn on oven. When it’s pre-heated, roll dough into balls and bake for 12 min. Cool in pan 1 min, then transfer to wire rack.